Banking on our enriched industry experience, we are able to supply Wooden Wedding Cards. With sincerity and hard work of our professionals, we have carved a niche for ourselves in this domain by providing a premium quality gamut of Wooden Marriage Invitation Card. 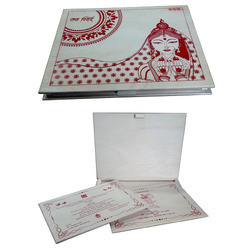 From our wide consignment, we are engaged in supplying Wooden Wedding Cards. We are a top-notch organization, engaged in providing Wooden Wedding Cards.